For example, the engineering of a digital camera would include defining the feature set, design of the optics, the mechanical and ergonomic design of the packaging, developing the electronics that control the various component and developing the software that allows the user to see the pictures, store them in memory and download them to a computer. 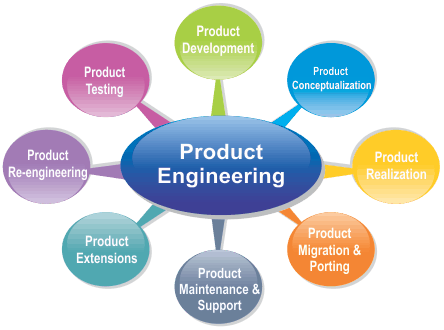 Product engineering is an engineering discipline that deals with both design and manufacturing aspects of a product. The following are core skills you should work on acquiring if you want to be a Product Engineer. Define qualification plan and perform feasibility analysis. Product engineers are the technical interface between the component development team and the production side (Front End and Back End), especially after the development phase and qualifications when the high volume production is running. Product engineers improve the product quality and secure the product reliability by balancing cost of test and test coverage that could impact the production fall-off. They support failure analysis request from customers. A product engineer will use a wide range of tools and software, possibly including: 20/20, AutoCad, CATIA, PTC Creo, Solidworks, Unigraphics, Labview, JMP, DataConductor.